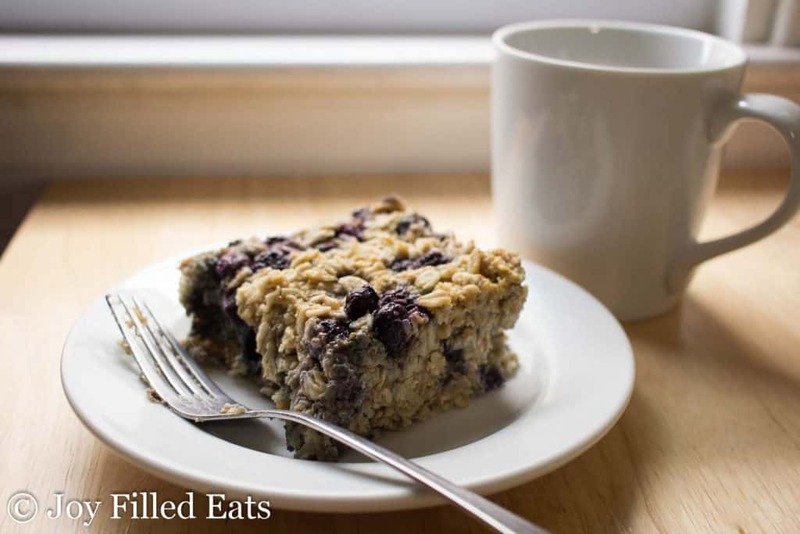 My Healthy Baked Oatmeal is perfect for my fellow breastfeeding mamas or anyone who just wants a warm piece of comfort. 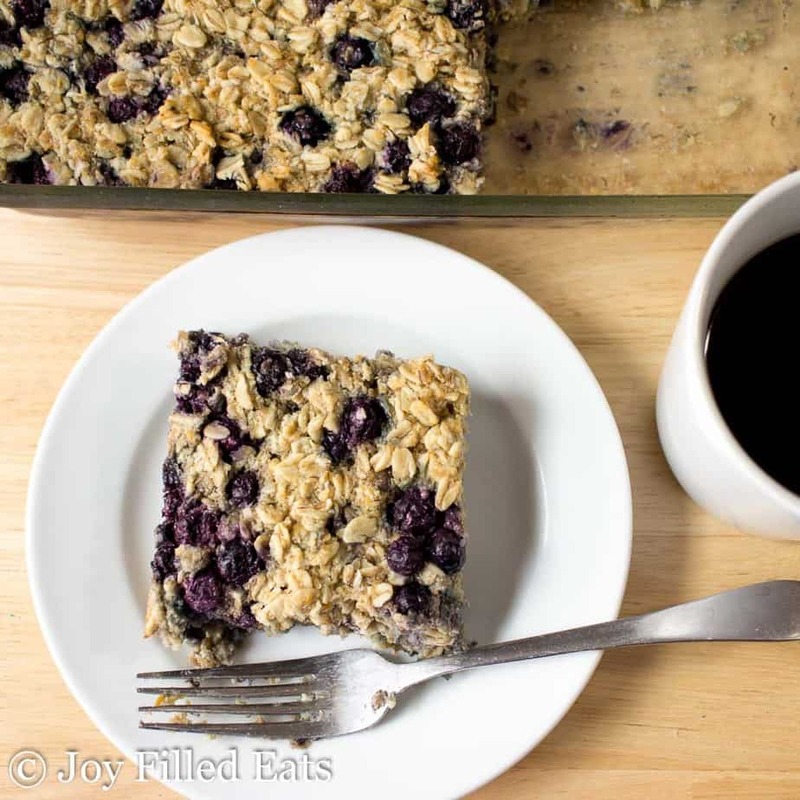 It is gluten-free, dairy-free, sugar-free, and Trim Healthy Mama friendly. I love oatmeal. Whenever I am nursing an infant I try to have it in my meal plan frequently because of its lactogenic properties. Occasionally that has been in the form of way too many of my friend Marisa’s oatmeal craisin cookies. I needed to take my dear friend’s recipe and make it healthier and a little easier. 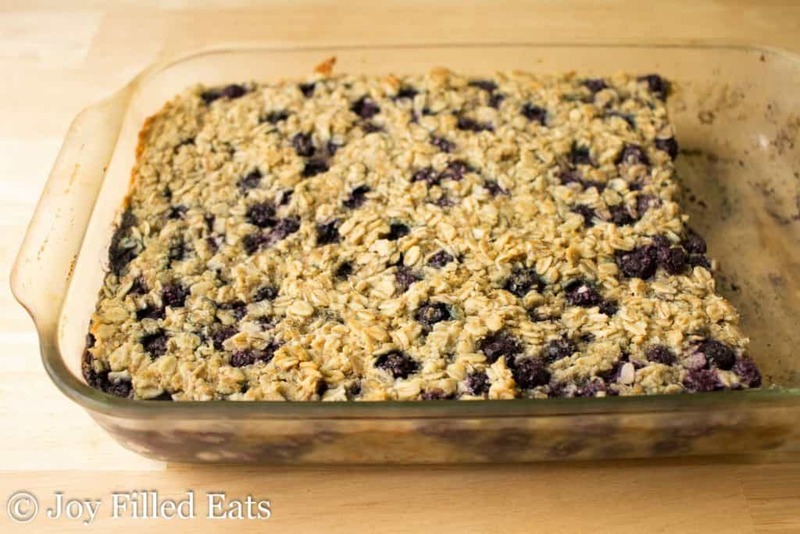 The first time I made this healthy baked oatmeal was about a week after having my 5th baby. I don’t remember (sleep deprivation and all) but I was probably holding him as I made it. it is just measuring, mixing, dumping, and then baking. Amazingly, this also freezes well! Since I made it just for me (stay out of my healthy baked oatmeal husband) I wrapped individual squares in plastic wrap and froze them. Then when I wanted one for breakfast I would just put it on a plate and pop it into the microwave. This would be great to add to your before the baby comes freezer meal stash. We often think of dinners and eat leftovers of those for lunch, but neglect breakfast. 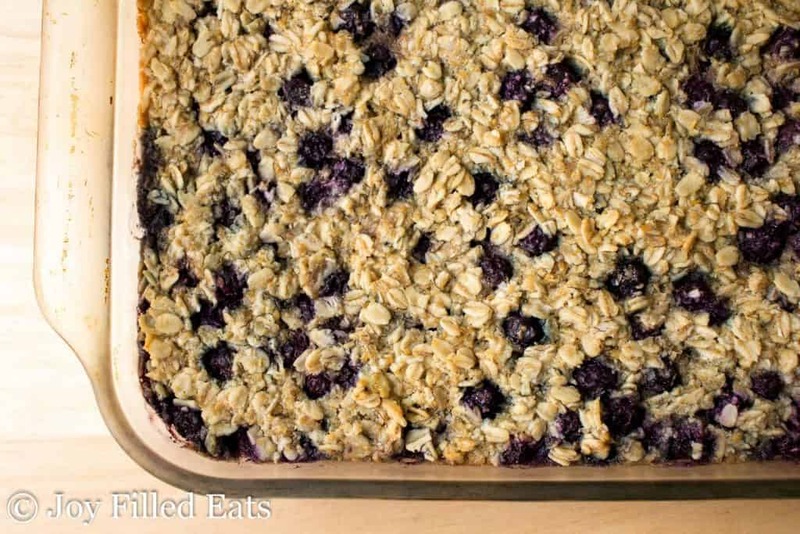 This is a great base recipe to play around with. You can switch out types of fruit, add spices, add some butter to replace some of the coconut oil, and more. 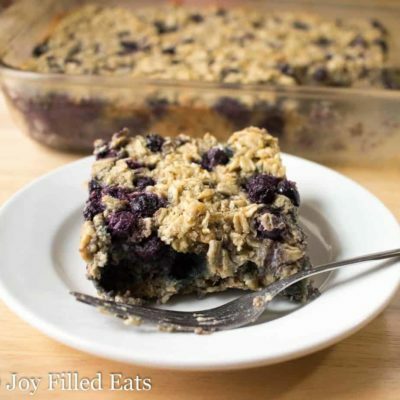 If you leave out the bananas you may need to increase the sweetener since they add a lot of natural sweetness to this recipe. 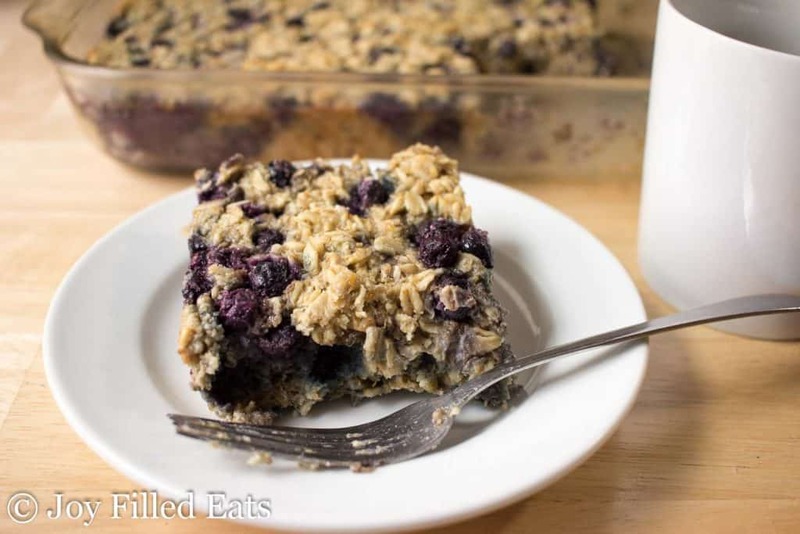 My Banana Blueberry Healthy Baked Oatmeal is perfect for my fellow breastfeeding mamas or anyone who just wants a warm piece of comfort. 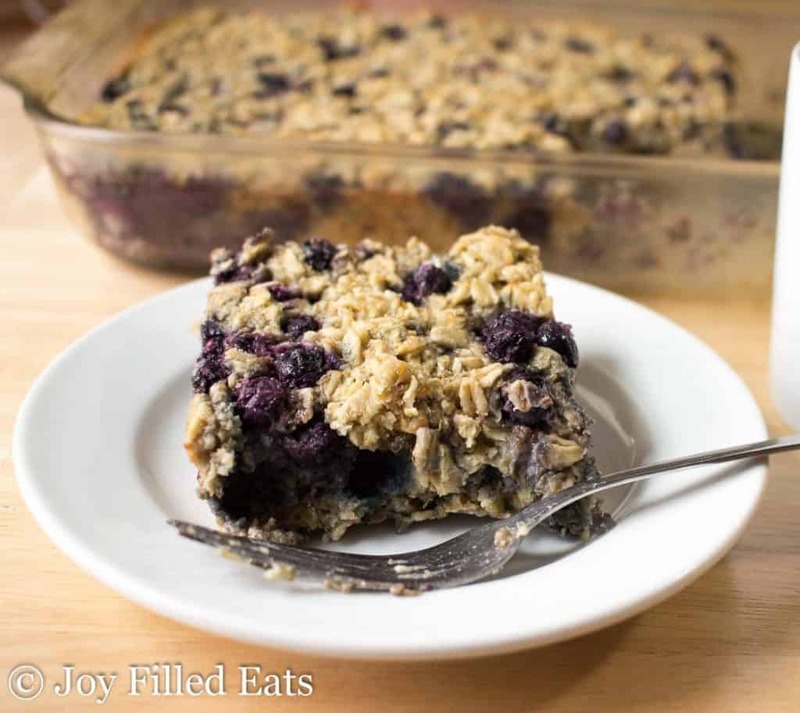 It is gluten-free, dairy-free, sugar-free, and Trim Healthy Mama friendly. Stir together wet ingredients and sweetener. Add dry ingredients and mix well. Grease a 9x13" baking dish. Spread in the oatmeal. Bake at 350 for 40-50 min until firm. Also, you could cut back on the coconut oil and use egg whites next time this would be a solid E.
I am allergic to Bananas, how would this be without them? I've made it without bananas too. I increase the sweetener to 1 cup. It's cook with some chopped apples and cinnamon.